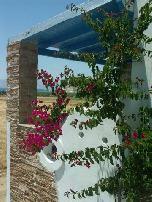 Manolis Studios welcome you at Naxos island. An island famous for its magnificent nature, endless blue sea, unique beaches and warm hospitality. They are located at Mikri Vigla – Kastraki, the most organized in tourism area. Mikri Vigla has a beautiful, long beach, where you can enjoy all sort of water sports. 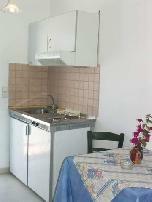 The studios have easy access to several beaches (Mikri Vigla, Kastraki, Aliko, Pyrgaki, Orko, Plaka, Agia Anna, Agios Prokopios, etc). Manolis Studios are consisted of 10 fully equipped studios that can accommodate 2 to 5 persons. They operate from April to October. All studios have their own bathroom, fridge, fully equipped kitchenette, A/C, TV, maid service and open verandas. The complex has a large garden with special space for your children, private parking, pool and child’s pool. There is a bus station very close to the hotel with 3 daily courses to the capital (Chora). The area has all the infrastructures to make your holidays more pleasant. There is a super market, bakery, restaurant and sports center very close to the hotel. Mikri Vigla in the ideal beach for windsurfing and a pole of attraction for the lovers of this water sport. There is a Windsurfing Κitesurfing Learning School in the area. There is also a riding school close to Mikri Vigla. Take a walk or practice on your favorite sport and enjoy nature and its unique beauties. Είστε ιδιοκτήτης ή διευθυντής στο MANOLIS STUDIOS-APARTMENTS - KONTZALAS MANOLIS; Εγγραφείτε τώρα για δωρεάν εργαλεία, που μπορείτε να χρησιμοποιήσετε για να βελτιώσετε την καταχώρησή σας και να συνδέσετε την ιστοσελίδα σας και το σύστημα κρατήσεών σας.